Hosted by GLOWS and Selkirk College, the Regional Science Fair taking place Saturday, April 14, 2018 at Selkirk College’s Castlegar Campus Gymnasium is an opportunity for selected students to showcase their exemplary work. 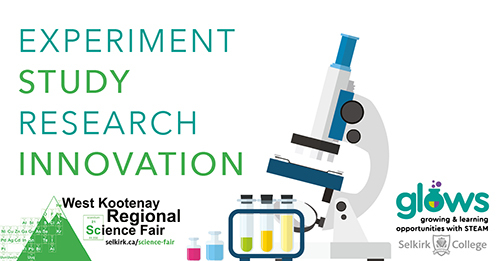 The West Kootenay & Boundary Regional Science Fair gives top students from around the region an opportunity to showcase their select science experiments, studies, research or innovation projects to be judged by volunteers from various science professions. Explore the world around you through inquiry-based learning! All Grade K to 12 students in School Districts 8, 10, 20, and 51 qualify. 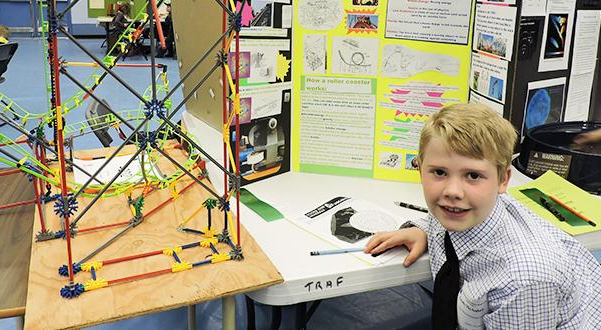 More than 100 youth are selected at the school level to enter in the annual West Kootenay & Boundary Regional Science Fair. Why Participate in the West Kootenay & Boundary Regional Science Fair? Science fair participation increases youth understanding and use of scientific inquiry and offers direct feedback on student projects, including research, experimentation and innovation. It also showcases local science education and career opportunities and allows youth to connect with science professionals working in a variety of fields. Innovation – Design and test new devices, models, theories, or method in any science discipline. Research – Written study of a question of scientific interest. Study – Analyze collections of data using accepted scientific methods. Experiment – Actively test a hypothesis by experimental methods. Find out all of the information HERE! 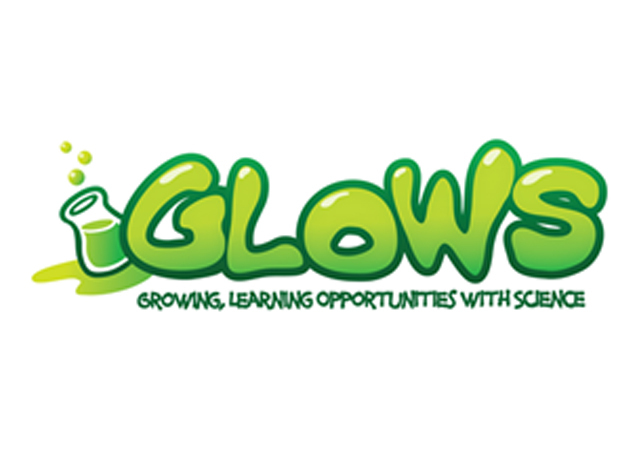 GLOWS- Growing, Learning Opportunities With Science– is a youth science education program initiated by the Kootenay Association for Science and Technology (KAST). 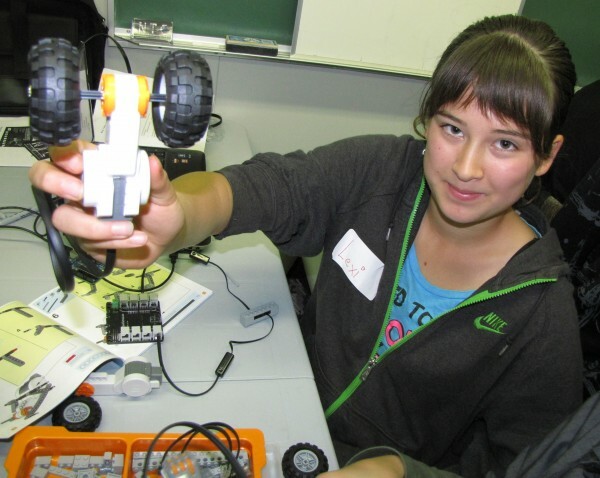 With the goal of inspiring and supporting youth interest in science and technology, the program has supported projects throughout the Kootenay-Boundary region ranging from robotics circuit training and competition to summer science camps to the West Kootenay Regional Science Fair. GLOWS partners with many educators, scientists, municipal organizations and community members to bring high quality science- and technology-related events and activities to our youth. Students love the activities and events, and parents love that their children are receiving hands-on, creative and engaging opportunities to advance their knowledge of science and technology. What’s more is that the program is helping to build a future generation of scientists, engineers, educators and innovators who are personally invested in the Kootenays and who are most likely to share their talents and resources in the Kootenay Boundary area, contributing to the region’s economic success and viability. Earlier this year it was identified that the mandate of GLOWS would be more likely to realize its goals under the educational management and mandate of Selkirk College. Faced with significant challenges, primarily that of adequate operational funding, and wanting to keep the program going, the KAST board made the decision that GLOWS would work with Selkirk College to transition to Selkirk’s Community Education & Workplace Training (CEWT) program. Taking over the GLOWS program allows Selkirk College to promote their own mandate to support lifelong learning which includes the young learners in our communities. GLOWS provides Selkirk a means through which they can outreach to the K-12 population and increase programming while supporting current and future full time employees. Where GLOWS was previously lacking in the necessary administrative support and resources, Selkirk’s administrative support, resources and partnerships are extensive and will be able to contribute to the continued evolution of GLOWS operationally and programmatically. Additionally, as a program under Selkirk College, GLOWS can apply to become an Actua member, strengthening GLOWS training, networking, access to resources and programming. Last, but not least, the transition of GLOWS provides significant opportunities for current Selkirk students to develop and practice their skills, engage with local communities, local industry and their younger peers. Under the Actua model, Selkirk students will be the primary staff of the GLOWS program. A student coordinator will develop programming to fit delivery in a variety of settings (in-class, after-school and summer programs), and student instructors will deliver the programs. It is anticipated that student hires will be from the STTEAM fields, with an emphasis on hands-on, interactive science and technology exploration. GLOWS provides community-based science workshops, camps, events and initiatives, as well as outreach in the Kootenay-Boundary region of BC to youth ages 5-19. Programming will be provided in at least 10 rural communities and will include robotics, coding, chemistry, engineering, environmental science, physics and biology, among other subjects. GLOWS partners with schools, professional associations and other organizations to provide initiatives that allow children of all ages to participate in hands-on science exploration. Activities are designed and facilitated by Selkirk College students and supported by Selkirk’s facilities, resources and staffing. 3. To provide youth with the pathways to follow and tools they need to pursue postsecondary education and careers in science and technology. GLOWS will accomplish their objectives through four main activities: 1) in-school workshops, 2) after-school science clubs; 3) summer science camps, and 4) special events and initiatives. In fall 2016, GLOWS will begin offering in-class workshops for all interested elementary/science teachers within the four partner school districts: Arrow Lakes (SD 10), Boundary (SD 51), Kootenay Columbia (SD 20), and Kootenay Lake (SD 8). Workshops will address provincial Prescribed Learning Outcomes (PLOs) which set the learning standards for the provincial K to 12 education system and form the prescribed curriculum for British Columbia. PLOs are statements of what students are expected to know and do at the end of an indicated grade or course, and schools have flexibility in determining how delivery of the prescribed learning outcomes can best take place. GLOWS can support teachers, particularly elementary-level teachers by enhancing instruction of science in the classroom. Workshop content will be developed by GLOWS staff – two paid Selkirk student instructors – who wiill arrive in each classroom equipped with supplies, enthusiasm, and excitement for a busy two-hour science, engineering, and technology workshop. Sessions will consist of exciting demonstrations, interactive experiments, and hands-on activities on subject matters in chemistry, computers, physics, biology and more. Upon completion of the workshop, the class will have developed an excitement for science, engineering, and technology while interacting with positive postsecondary student role models. As with the in-school workshops, after-school clubs will be provided by Selkirk science students one day per week at an elementary or middle school. Clubs will typically run 1-2 hours and are full of interactive, hands on, and experiential science learning. During the months of July and August, GLOWS will offer science camps to youth in grades 2 through 7. Youth in communities not currently served by recreation organization or municipality camps, such as New Denver, Nakusp, Kaslo and others not served by municipal organizations, are eligible to attend our science, engineering and technology-focused summer camps. All summer camp programs mix incredible experiments, fun indoor and outdoor activities, and face time with postsecondary science students. Camps emphasize exploration of science, engineering and technology through hands-on activities, labs, games and week-long projects. Campers get the opportunity to explore the university, meet researchers, and conduct experiments in real labs. Since 2007, GLOWS has supported and provided unique and stimulating science events and initiatives throughout the region. Increases youth understanding and use of scientific inquiry and offers direct feedback on student projects, including research, experimentation and innovation. Showcases local science education and career opportunities to public and families. Provides inspiration and opportunities for girls to meet female science professionals through panel discussions, hands-on workshops and a keynote speaker. Girls learn about critical requirements for entry and advancement into science and technology education and careers. Individuals and teams of youth design, build and program robots to compete in the RoboGames. Provides youth with experience and knowledge valuable for engineering and computer sciences. Youth design and construct popsicle bridges which are tested by APEGBC professionals to determine their load bearing capacity. They increase understanding about engineering and physics. Up to $7,500 to help your company hire a business or technical student. Apply here. http://kast.com/wp-content/uploads/2019/03/KASTLogo-2019-white-lo-1.png 0 0 Tracy Connery http://kast.com/wp-content/uploads/2019/03/KASTLogo-2019-white-lo-1.png Tracy Connery2016-05-02 00:00:002017-03-13 11:16:05GLOWS Transferred to Selkirk! Hire A Student – Apply Now! There’s a way you can enjoy an eager helping hand while at the same time providing valuable work experience to a young, motivated student: Hire a student. Hire a student and expect tremendous benefits! Hiring a student is not just a great way to help add to the skills and experience of a business or technical student, but it’s also a great addition to your business, where an enthusiastic and receptive young person can contribute in any number of ways. If your manufacturing or technology business could use an enthusiastic and eager employee this summer KAST and BCIC can help. BCIC Innovator Skills Initiative (BCIC-ISI) provides post-secondary students from across BC with business, technical, innovation and entrepreneurial training, skills and experience to meet the needs of industry in BC. The program focuses on exposing students to regional industry needs and challenges, while providing students with the skills required to run a successful business. KAST can provide up to $7,500, matched by your business either in cash, in kind or a combination of both, to help your company hire a business or technical student NOW! Students must be currently enrolled as a BC post-secondary student and be hired for a minimum of 25 hours per week for 3 to 4 months for business or technical purposes (i.e. not admin). Their employment must be completed by September 30th, 2016. Companies must be based in the East and West Kootenays and the Boundary region of BC. The student work must be undertaken in BC. To apply, please fill out this form and submit by email to glows@kast.com by May 10, 2016 at 5pm. See the complete program guidelines HERE. Student opportunities in the BC Jobs Plan sectors are encouraged. http://kast.com/wp-content/uploads/2019/03/KASTLogo-2019-white-lo-1.png 0 0 Tracy Connery http://kast.com/wp-content/uploads/2019/03/KASTLogo-2019-white-lo-1.png Tracy Connery2016-04-15 00:00:002017-03-13 11:16:05Hire A Student – Apply Now! Robotics Training Ramps Up Ahead of RoboGames! 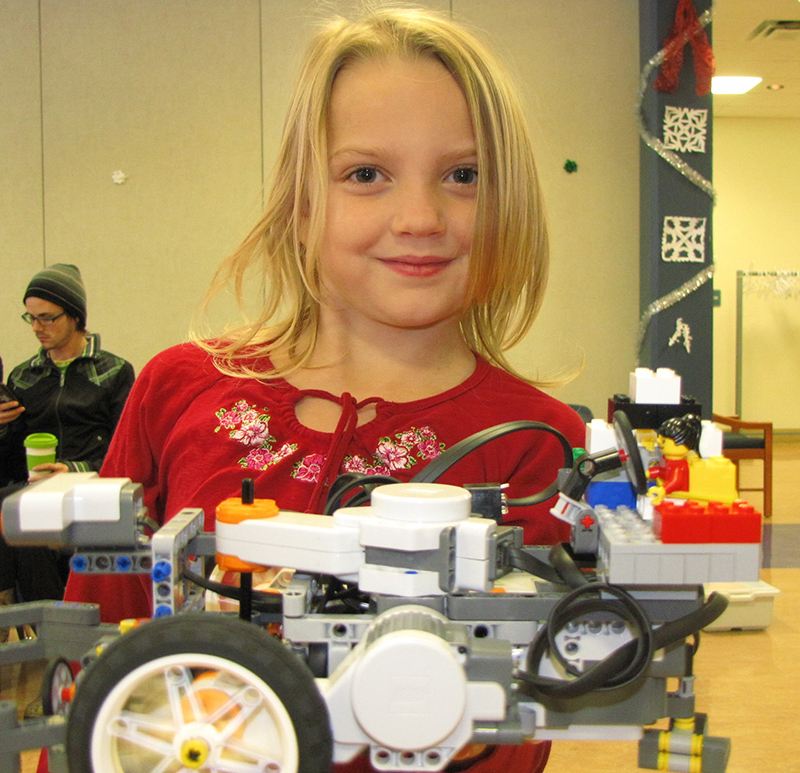 The fourth annual RoboGames competition has launched, and teams of youth ages 10‐16 are hard at work designing, building and programming robots across the West Kootenays. They’re off! The fourth annual RoboGames competition has launched, and teams of youth ages 10-16 are hard at work designing, building and programming robots across the West Kootenays. All teams are preparing for the 2016 RoboGames competition to be held on Saturday, February 20 from 9 am to 3 pm at Selkirk College’s Mary Hall in Nelson. RoboGames is a collaborative initiative between the Nelson Tech Club and GLOWS, with support from the Kootenay Association for Science and Technology and Selkirk College. While in past years the robotics training was held exclusively in Nelson at Selkirk College, this year Nelson Tech Club President Brad Pommen developed a series of online training courses, eliminating the need for teams to travel more than 200 km roundtrip weekly to attend. Additionally, GLOWS Program Manager Beth Corven delivered more than 35 Arduino base kits to teams throughout the region in the early weeks of December. As a result, RoboGames 2016 is the largest, most diverse event we have ever attempted to date. Obstacle Course: Robots maneuver an obstacle course as quickly and carefully as possible. Line Following Course: Robots utilize the obstacle course, except that they follow the line from end to end with speed and accuracy judged. Robot Soccer 1 on 1: A pile of robot soccer balls is located in the center of the obstacle course. Competitors vie against an opponent to try to grab the most robot soccer balls to their side in two minutes. Special Trick Competition: Competitors program their robot to do their evil, or not so evil, bidding by coming up with something cool and crazy for their robot to do. Examples are dancing, telling a joke, fetching an object… competitors are encouraged to use their imagination! Robot Battles: Two robots enter the open arena to compete as gladiators in the ultimate destruction event. Judges determine the winner based on meaningful hits, overall match polarity and gamesmanship. All teams will be using the official RoboRED Arduino kit provided by RoboGames. This official base kit contains the starting materials which can be supplemented by teams as they progress. Code examples, photos and tutorials are provided online to ensure that all hardware works together and eliminates guess work when hooking it up. Each team decides which components they will use, what they want their robot to do, and what it will look like. In January, Pommen will travel to up to six locations to provide hands-on robotics training to mentors and youth, with online training provided to all locations upon demand. The actual competition will take place in the basement of Mary Hall at Selkirk College’s Tenth Street Campus in Nelson. http://kast.com/wp-content/uploads/2016/02/RoboGames.jpg 300 640 Tracy Connery http://kast.com/wp-content/uploads/2019/03/KASTLogo-2019-white-lo-1.png Tracy Connery2016-02-18 06:03:152016-02-18 06:03:15Robotics Training Ramps Up Ahead of RoboGames! http://kast.com/wp-content/uploads/2019/03/KASTLogo-2019-white-lo-1.png 0 0 Tracy Connery http://kast.com/wp-content/uploads/2019/03/KASTLogo-2019-white-lo-1.png Tracy Connery2016-02-18 00:00:002016-02-18 00:00:00Robotics Training Ramps Up Ahead of RoboGames! Prepare for the Robogames that will take place February 20, 2016. Registration is now closed. Each week, starting December 13th, Nelson Tech Club President, Brad Pommen will post a new lesson online, focusing on the basics of Arduino software, leading to the final assembly of several different example robots, including code to get you started. We recommend that every participant spend at least 1 hour each week learning how to turn a twitching mess of electronics into a well-formed robotic masterpiece. By following our tutorials and code lessons you will learn the skills required to be successful. Arduino can be daunting at first, we have successfully trained over 100 participants in previous RoboGames events. Knowing that a bit of hands on help is needed for most new participants, Brad will be hitting the road in January to help teams for onsite training outside of Nelson. This includes Rossland, Trail, Castlegar, New Denver & Kaslo.